Our Trading Division has quoted for the supply and delivery of 7 sets of Axial fans to our agent in Bangladesh. He requested the quotation last week end. 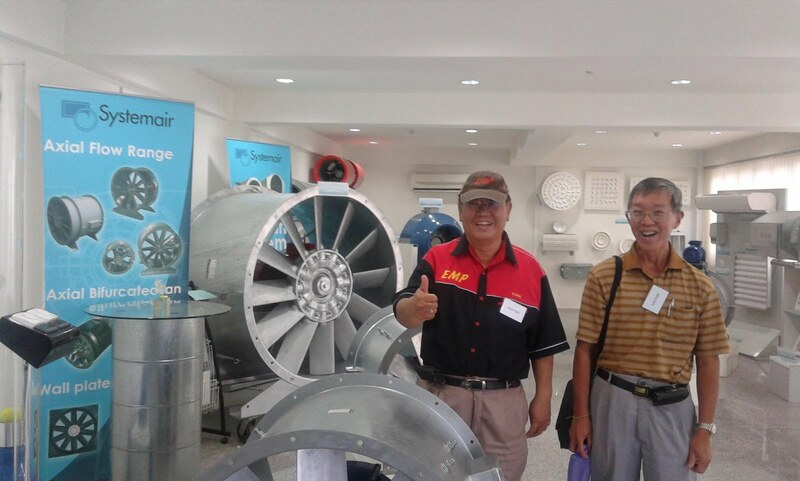 Our agent was successful in obtaining 15 sets of Centrifugal fans last year and hopefully, we will be successful again soon. Our quoted price is competitive and we look forward to some good news soon. News have been received that our company will be receiving a trial order of 1.2mt of Ethephon Plus 2.5% for this new customer. They want to try out our Ethephon Plus 2.5% (Blue) to see how effective and reliable the latex stimulant works. If all works well, a larger order will be forthcoming. This is a good breakthrough for our export of rubber latex stimulants as it is being ordered by a new rubber producing country. The Managing Director and Director of EMP Malaysia paid a courtesy factory visit to Systemair Manufacturing facility in Kuala Lumpur today. Besides the Skim processing machinery and dryer order, we also secured a Sartorius Metal Detecting system c/w belt conveyor for this project. The Metal detector will be used to detect ferrous and non-ferrous contamination in the rubber bales before they are shipped out. It will be the final inspection before the skim block bales are crated out. Over the years, more and more factories are resorting to our Sartorius Metal Detecting system for scanning for contamination in their final products. During our visit to Southern Thailand last week, our Managing Director has been tasked to offer a palletising plant. The pallets are to be used as fuel feed for boiler application. We were able to source a manufacturer for such a plant in Malaysia especially with our extensive network built up over the years. Our manufacturers and suppliers include rubber processing machinery manufacturers, agronomic consultants, industrial fan specialists, industrial suppliers and in-field/processing consultants. Just received the above export enquiry for the supply and delivery of Ethephon latex stimulants to a rubber growing country. Their expected usage in 2012 is projected to be around 29,600 kg of Ethephon at 2.5% and 2500 kg of Ethephon at 5% concentration. We have received enquiries from end users and distributors for the supply and delivery of our Ethephon latex stimulant products. Our Ethephon Plus products have been effectively used for increasing rubber trees yield without harming the trees. Our company has been supplying these products since 1990 to an African plantation group. This consignment will be shipped out on 9th. 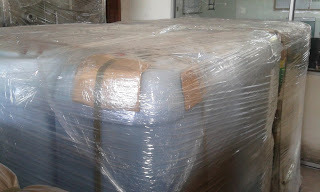 April 2012 and the goods have been delivered to the shippers warehouse. Our Projects and Engineering Division has just submitted a 2mt/hr Crumb Rubber Processing line to a potential client in Ivory Coast. We quoted them in 2008 but due to the instability in Ivory Coast from 2008 to 2011, they were not able to invest in this line. However, with the political situation in Ivory Coast has stabilised, they are re-activating this proposed project. They have requested us to submit our proposal for this 2mt/hr line and also to supply some specific machinery. Our Managing Director has decided to spot a new look for our Corporate image. Instead of our casual red T shirt with our EMP logo for field work, we want to project a smarter corporate image by incorporating our formal corporate shirt. Lighter in weight and made from cotton, the new corporate shirt will be worn by our team for official functions where we have to meet our customers and clients. We want to invoke a sense of confidence for our clients who have supported our company over these past 27 years.